During her recent trip to Hanoi, Vietnam to attend Burberry new store opening, Yoon Eun Hye (윤은혜) also participated in an editorial shoot with Harper's Bazaar Korea for their June 2013 issue. 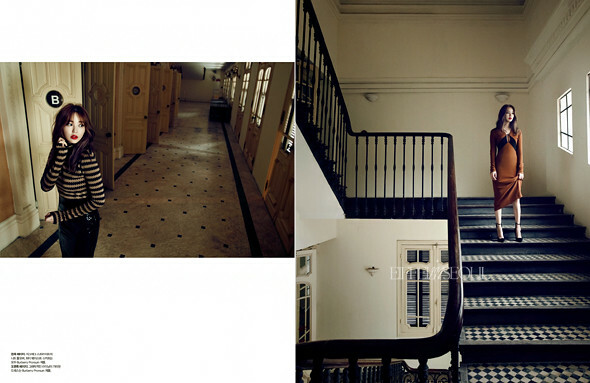 The shoot took place at the beautiful Sofitel Legend Metropole Hotel located in Hanoi, Vietnam. The actress had a wardrobe full of Burberry garments for the editorial. Yoon Eun Hye (윤은혜) was recently seen wearing a Fall/Winter 2013 look to Burberry store reopening in Seoul, South Korea. Click here to view post.